The Genre field is no longer nullable (that is, you must enter a value). The Rating field has a maximum length of 5 and Title has a maximum length of 60. The minimum length of 3 on Title and the range on Price did not create schema changes. The string fields show the new length limits and Genre is no longer checked as nullable. 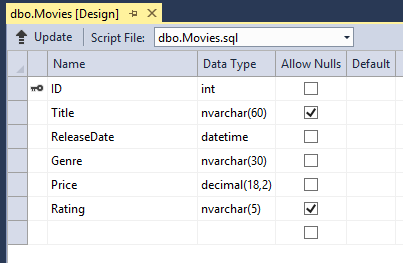 The validation attributes specify behavior that you want to enforce on the model properties they are applied to. The Required and MinimumLength attributes indicates that a property must have a value; but nothing prevents a user from entering white space to satisfy this validation. The RegularExpression attribute is used to limit what characters can be input. In the code above, Genre and Rating must use only letters (white space, numbers and special characters are not allowed). The Range attribute constrains a value to within a specified range. The StringLength attribute lets you set the maximum length of a string property, and optionally its minimum length. Value types (such as decimal, int, float, DateTime) are inherently required and don't need the Required attribute. Run the application and navigate to the /Movies URL. Click the Create New link to add a new movie. Fill out the form with some invalid values. As soon as jQuery client side validation detects the error, it displays an error message. to support jQuery validation for non-English locales that use a comma (",") for a decimal point, you must include the NuGet globalize as described previously in this tutorial. A real benefit is that you didn't need to change a single line of code in the MoviesController class or in the Create.cshtml view in order to enable this validation UI. 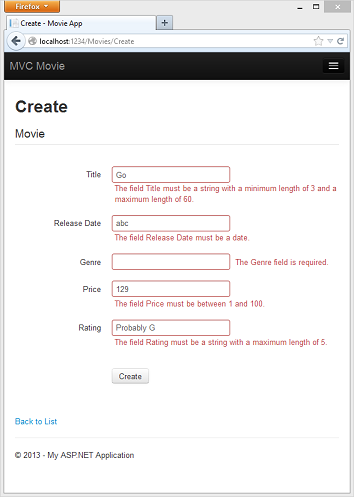 The controller and views you created earlier in this tutorial automatically picked up the validation rules that you specified by using validation attributes on the properties of the Movie model class. Test validation using the Edit action method, and the same validation is applied. The form data is not sent to the server until there are no client side validation errors. You can verify this by putting a break point in the HTTP Post method, by using the fiddler tool, or the IE F12 developer tools. 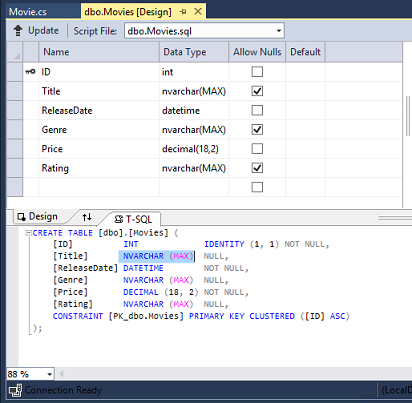 Open the Movie.cs file and examine the Movie class. The System.ComponentModel.DataAnnotations namespace provides formatting attributes in addition to the built-in set of validation attributes. We've already applied a DataType enumeration value to the release date and to the price fields. The following code shows the ReleaseDate and Price properties with the appropriate DataType attribute. The DataType attributes only provide hints for the view engine to format the data (and supply attributes such as <a> for URL's and <a href="mailto:EmailAddress.com"> for email. You can use the RegularExpression attribute to validate the format of the data. The DataType attribute is used to specify a data type that is more specific than the database intrinsic type, they are not validation attributes. In this case we only want to keep track of the date, not the date and time. The DataType Enumeration provides for many data types, such as Date, Time, PhoneNumber, Currency, EmailAddress and more. The DataType attribute can also enable the application to automatically provide type-specific features. For example, a mailto: link can be created for DataType.EmailAddress, and a date selector can be provided for DataType.Date in browsers that support HTML5. 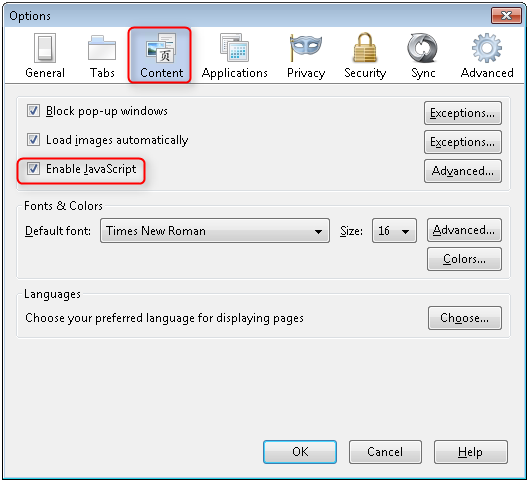 The DataType attributes emits HTML 5 data- (pronounced data dash) attributes that HTML 5 browsers can understand. The DataType attributes do not provide any validation. You will need to disable jQuery date validation to use the Range attribute with DateTime. It's generally not a good practice to compile hard dates in your models, so using the Range attribute and DateTime is discouraged.